Hurricane Matthew caused death and destruction from the Caribbean to North Carolina. 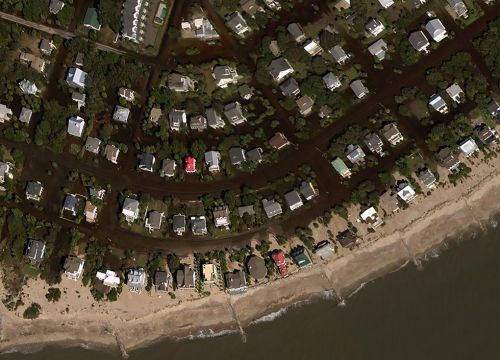 From Oct. 7-10, 2016, the National Geodetic Survey collected aerial photos from more than 1,200 square miles of flooding and damage in the hurricane’s aftermath. The photos were taken in specific areas of the nation identified by the Federal Emergency Management Agency and the National Weather Service. National Ocean Services has more information on how the photos were collected. All the photos can be accessed online. The areas with imagery are shown as blocks on the map; zoom in to see the high-resolution aerial photos (which may take a few seconds to load). For more coastal weather conditions NOAA’s nowCOAST™ web portal is a near-real-time, one-stop look at coastal conditions and includes storm surge flooding maps. Edisto Beach, South Carolina before Hurricane Matthew.